Peanut Butter Pudding Cookies - The Chips Have It! Just describing these soft little cookies to you gets my mouth-watering! I have several pudding cookie recipes bookmarked to try, but these cookies are the first pudding cookies I have ever made. After one delicious bite, I was left wondering why in the world did I wait so long? Adding instant pudding makes the cookies so moist that they just melt in your mouth. They're best warm from the oven (seriously what cookie isn’t?) but also taste amazing at room temperature. If you're a chocolate and peanut butter fanatic like me, this recipe is for you! So what are you waiting for? These cookies aren’t going to bake themselves! Pour that glass of cold milk and get baking, just be careful you don't burn your tongue on those melty chocolate chips. 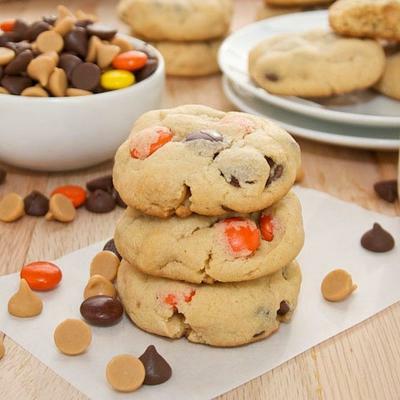 Soft peanut butter pudding cookies bursting with milk chocolate chips, peanut butter chips, and Reese's Pieces. Preheat the oven to 350F degrees. Line 2 cookie sheets with parchment paper. In a medium bowl, whisk together flours, baking soda, salt and pudding; set aside. In the bowl of a stand mixer fitted with the paddle attachment, beat butter, peanut butter, sugar and brown sugar on medium speed until light and fluffy, about 3 to 4 minutes. Add eggs, one at a time scraping down the sides of the bowl as needed. Add vanilla extract and honey and beat until combined. Reduce speed to low and add flour mixture, beat to combine. Now in another bowl, mix eggnog with one egg yolk and whisk it into this bowl. Add the ricotta cheese and 1 box of cream cheese pudding (following the box), and cream cheese, whisk and mix well. Fold this in last before you add the all the Chips. Add chocolate chips, Reese's pieces and peanut butter chips and toffee chips. Stir in toasted sweet coconut and mix until incorporated. Roll a heaping tablespoon of dough into a 1 1/2-inch ball between your palms and then place it on the prepared baking sheet. Repeat with the remaining dough, spacing the balls about 2 inches apart (you should be able to fit 12 cookies on each sheet). Using the bottom of a glass dipped in sugar, gently flatten the dough balls until they are about 3/4-inch thick. Let cookies cool on sheets for 2 minutes before transferring to wire racks to cool completely. You can also sip these in melted Merkins chocolate. This recipe makes about 3 dozen Peanut Butter Pudding Cookies.